I have always thought I disliked marzipan. Maybe I do, or maybe I just haven’t tried any good stuff, because it turns out I LOVE what the Italians describe as Sicilian marzipan cookies. Fior di mandorla (or pasta di mandorla) are little bites of toothsome sweetness, like a coconut macaroon with ground almonds instead. They are at once both airy and dense — the outer layer light and crispy, the inside chewy and sweet — and in plain almond or flavored with good things like orange. When we visited the island of Lipari they had their own version. 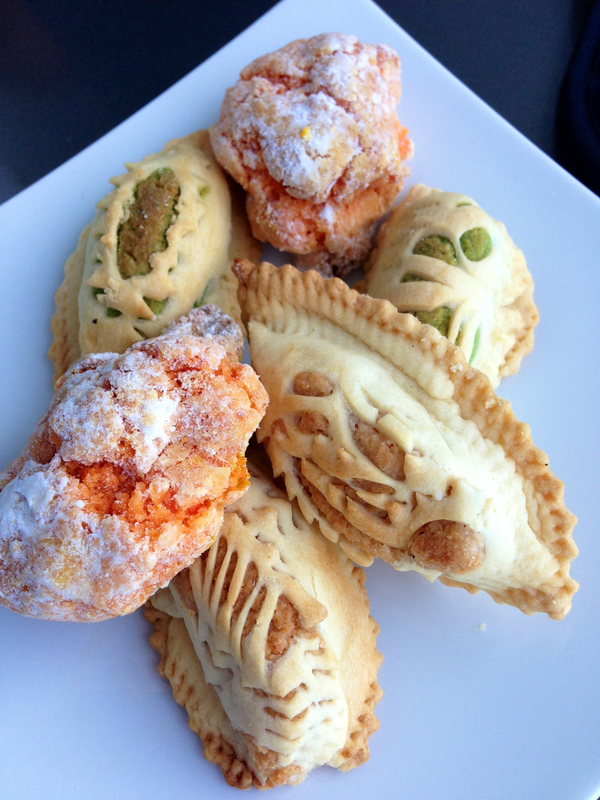 Nacatuli have dense nut centers surrounded by a soft dough cut into elaborate design and baked. The centers are almond, naturally, but can have other flavors like pistachio. I got several packages of each and have been doling them out to Jer and me in a stingy fashion. Soon they will be gone and it’s clear if I want anymore I am going to have to figure out how to make them myself.